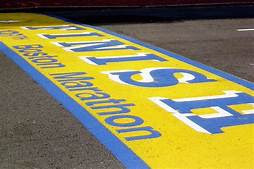 Inspired by Savannah: Jesus: His Life Series Finale + The Boston Marathon + My Cancerversary = A Great Patriot's Day Tomorrow! Jesus: His Life Series Finale + The Boston Marathon + My Cancerversary = A Great Patriot's Day Tomorrow! 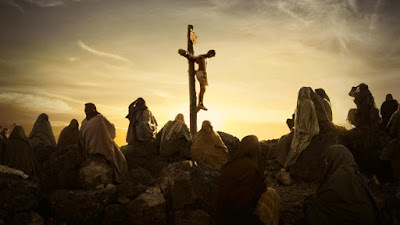 With Easter just around the corner, the final episode and series finale of “Jesus” His Life” airs tomorrow Monday, April 15 on The History Channel. Tomorrow is a very memorable date in my life. It is the last day I had radiation and chemotherapy at Dana Farber in Boston, MA, to beat stage 2 nasopharyngeal carcinoma, I was diagnosed with back in 2008. I had to undergo 40 rounds of radiation to my entire head and neck/shoulder area, and 3 months of high dose cisplatin chemo, so it was a very difficult treatment to say the least. As I drove into Boston on Patriot's Day, I saw all the people heading into the city to get a good stop near and around the Boston Marathon route. Seeing all these people dressed up in red, white and blue, and downing celebratory hats and accessories, I couldn't help but feel like this end date to my cancer treatment was meant to fall on this date. As people were coming into the city to root on the runners, it gave me a sense that they were there rooting me on to. Even though I wasn't running a race, I was heading towards a finish line that felt like a long time coming, and that had bumps along the way. You could say that my hospitalizations and setbacks during treatment were me trying to get through "Heartbreak Hill," which is the toughest part of the race course for marathon runners, as they near the finish line. Together I and the marathon runners would give it our all on this Patriot's Day, and cross the finish line, each achieving personal accomplishments and goals set for ourselves. There were times during treatment, especially in the beginning when I first heard the words, "You have stage 2 cancer," right before Christmas in 2007, to starting the treatments, that I didn't think I was going to make it. People kept telling me to have faith, and that God was watching over me and would guide me through. But, I found myself questioning my faith and God. If he was almighty and righteous, then why was I dealt these cards in my life. Not only have I had to deal with other autoimmune disorders and medical issues throughout my life, now I was given a 50/50 chance to live with a 70% survival rate. While the 70% looked good, I found myself hung up on the 50/50 odds. I had already watched my aunt and grandmother and other family members get a cancer diagnosis and pass away. I thought this was going to happen to me, too. Why was God taking all these people who were so kind and had so much to live for, away from me. And, why was I having to fight cancer, too, after all I have already had to deal with in life? Thanks to a nurse tending to me during my chemo treatments, she helped me see things differently and would pray with me at the start of the 5 hour treatments. I found myself thinking of this cancer diagnosis not as a death sentence, but as just another bump in the road of life. Instead of having my parents, brothers, or husband have to battle cancer, I was given this diagnosis as God knew I was strong enough and could handle it. Day after day I would head into Boston and receive treatment and had a countdown going to Patriot's Day when I would get my last radiation (of 40 rounds) and chemo. Being in Boston on this day/Marathon Day was on fitting, as there was a more hyped up atmosphere, and the streets on the marathon route would be filled with runners running in honor of family and friends who are no longer, running for personal reasons, or simply running to show that they can do the impossible and complete a marathon. I, too, was running my own race, even though it was not in the Boston Marathon, but in the race of life. I was looking to the finish line as a new starting line for a second chance at life. And, I was more than ready to push through it all, to cross that finish line. I had so much more I wanted to do in life including, have children, and start a new life in the house my husband and I had just bought months before my cancer diagnosis. As I mentioned above, I have an oncologist nurse who would sit with me during my chemo treatments. She would pray with me and for me, and talked me out of some dark days. It is people like here that I feel were sent to me during this time in my life from the man upstairs. He knew I would need some support, in addition that I was getting from family and friends, as he knew I would doubt my faith. And, with her support and guiding words, I was finally seeing the finish line and had my hands out reading to cease the moment and put this bump in the road behind me. Tomorrow will mark 11 years out of treatment. I was given the all clear on scans a few months later. But, this is the day I look to each year as a celebration of sorts. Some people who go through a cancer diagnosis start looking at their end date of cancer treatment or "Cancer free scan day" as their new birthday, and that I what I do. Patriot's Day each year is my Cancerversary, and I now get to celebrate it with two healthy girls, which is the icing on the cake. Back in 2015 I walked part of the Boston Marathon route with my family to celebrate 7 years cancer free. It was a very special walk, as I was healthy, had two girls of my own, and was able to raise money to help Dana Farber Cancer Institute, who helped give me a second chance at life and get rid of my cancer, help save more peoples' live through cancer research and advancements. While this is not a medallion for running in the Boston Marathon, it is a personal accomplishment and one I never thought was possible. Never give up in life, even if things don't look like they are worth fighting for...as they are, and you are! Tomorrow, after watching the Boston Marathon race and all the runners crossing the finish line, I will sit and have cake to celebrate my Cancerversary with husband and girls. Then, I will end the day by watching the series finale of Jesus: His Life on History. I started watching this series when it first began airing March 25, and have been waiting for this series finale. Again, coincidence that the series ends tomorrow, on this special day in my life. Watching this series had me thinking back to my special angel of a nurse sent to me and a few biblical passages she would always share with me, and that helped get me through my cancer journey, so that I can be here today, ready to celebrate 11 years cancer free. "2 Corinthians 12:9-10 But he said to me, “My grace is sufficient for you, for my power is made perfect in weakness.” Therefore I will boast all the more gladly of my weaknesses, so that the power of Christ may rest upon me. For the sake of Christ, then, I am content with weaknesses, insults, hardships, persecutions, and calamities. For when I am weak, then I am strong. 2 Corinthians 4:8-10 We are afflicted in every way, but not crushed; perplexed, but not driven to despair; persecuted, but not forsaken; struck down, but not destroyed; always carrying in the body the death of Jesus, so that the life of Jesus may also be manifested in our bodies. 2 Corinthians 1:4-7 He comforts us in all our troubles so that we can comfort others. When they are troubled, we will be able to give them the same comfort God has given us. For the more we suffer for Christ, the more God will shower us with his comfort through Christ. Even when we are weighed down with troubles, it is for your comfort and salvation! For when we ourselves are comforted, we will certainly comfort you. Then you can patiently endure the same things we suffer. We are confident that as you share in our sufferings, you will also share in the comfort God gives us." I hope you will join me tomorrow in watching the series finale of Jesus: His Life on the History Channel, beginning at 8 PM EST. It has been a very moving series, and one about Jesus' life that I have not seen before. The series reveals his journey through a complex world of kings, politicians, reformers and soldiers in a turbulent power struggle during a time of revolutionary change. 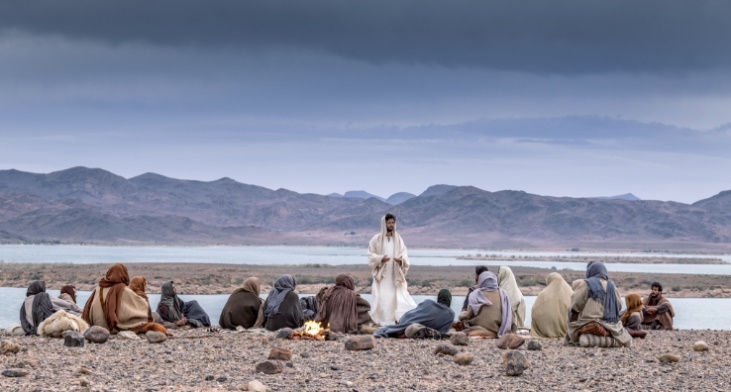 “Jesus: His Life” brings viewers into this dramatic world to reveal the greatest story ever told. Each figure takes a turn guiding viewers through the emotional and epic story of the most famous man in history, through his birth, death and resurrection, all conveyed through a combination of scripted drama and interviews with prominent religious and historical experts. Utilizing some of the world’s most respected Biblical scholars, historians, faith leaders and theologians, the series weaves together the canonical Gospels, historical sources and cultural context to create a complete portrait of Jesus – the man and the Messiah. The series finale airs this Monday, April 15 on The History Channel at 8pm ET/PT."